Daiso! is probably one of my favourite shops for bargained items. It’s the 2nd place where I don’t have to look at the price before getting anything (the first is Bookxcess). Especially plates and tableware and awesomely cute bakingwares. I mean it’s only RM5, what more can u ask for right. So we’re right in Daiso, 1 Utama and spotted this claypot (immediately thinks of claypot loh shu fen and claypot chicken rice) and it’s Spot on! Gotta have it at once. My friend and I bought 2 each, and we bought it all. There were only 4 left !! Hurrah! 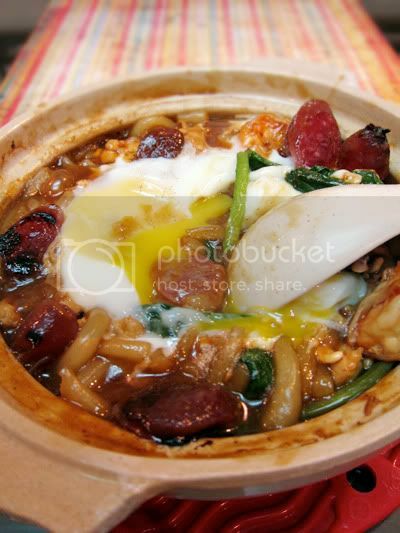 If we ever have claypot party, you have to bring your own claypot Lol..
Ok so what is Loh Shu Fun / Rat’s Tail noodles / ???. Don’t be deceived by its name, it’s just a type of Chinese noodle that looks like rat’s tail made from rice flour. It can be stir fried like Char Kuey Teow or, well I’ve seen people putting it in Laksa. But best would be cooked in a claypot! 2. Heat pan with some oil and add in garlic and red onion. Stir till fragrant. 3. Toss in marinated minced meat, prawns and cook for a few minutes. Remove from pan. 4. Heat up claypot and add in 1 tsp of oil. Add in loh shu fan and seasoning. Stir, then add in choy sum and cooked minced meat. 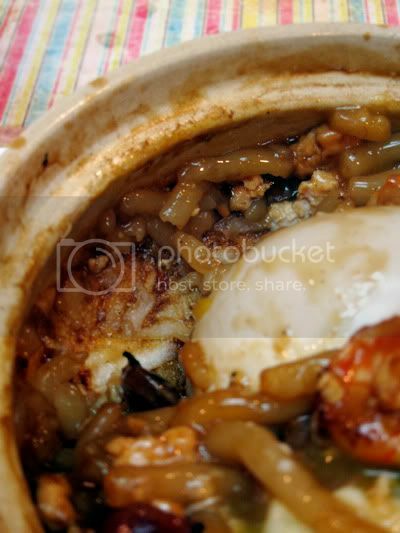 Close the lid of claypot and let it bubble for a few minutes. 5. Add in lap cheong and cook further. Dilute some cornflour with water and add into loh shu fun. 6. Turn off heat and crack an egg on top. 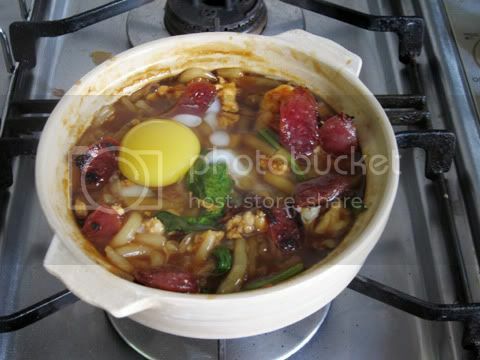 The egg’s suppose to be still wobbly and 1/2 cooked. At this stage, the heat has been turned off and the egg’s craked on top. By the time I moved to the table and grabbed the camera for photos, the egg whites were almost cooked. So don’t worry about not cooking the egg. 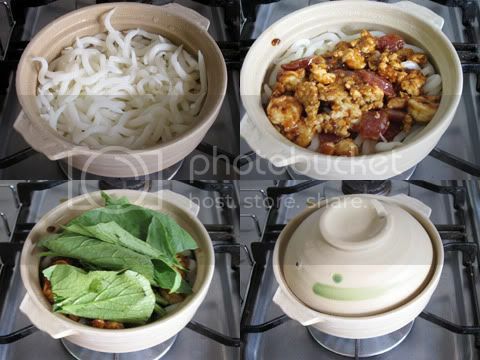 The heat from the claypot with slow-cook it..
Before cooking this, I was a bit skeptical on the claypot cause after all it’s the first time I’m using claypot. It didn’t break or leak or crack .AHAHA !! If you’re like me, cooking with a brand new claypot, I would suggest soaking the claypot with water for 30 mins or so just so it cooks better. 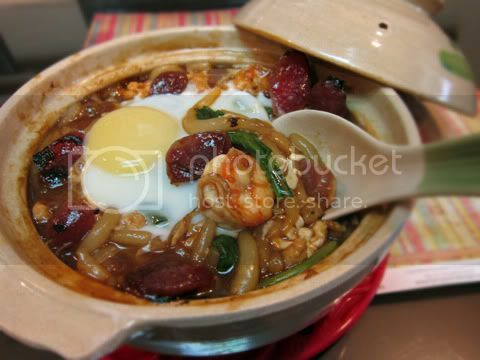 And for claypot, what I liked about it is that, the burnt stuffs that sticks to the sides of the claypot!! Next to try is claypot Chicken Rice !! HAha anyone got any recipes to share ?